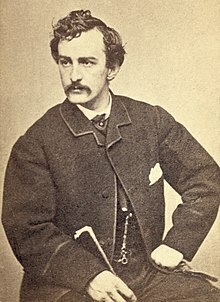 John Wilkes Booth (10 mai 1838 – 26 aprilie 1865) a fost un actor de teatru american, simpatizant fanatic al Statelor din Sud, care l-a asasinat pe președintele Abraham Lincoln la Teatrul Ford, în Washington, D.C., pe data de 14 aprilie 1865. Allen, Thomas B. ( 1992 ). The Blue and the Gray. Washington, D.C.: National Geographic Society. ISBN 0870448765. Bates, Finis L. ( 1907 ). Escape and Suicide of John Wilkes Booth. Atlanta, Ga.: J. L. Nichols. Library of Congress Control Number 45-052628. Bishop, Jim ( 1955 ). The Day Lincoln Was Shot. Harper & Row. Library of Congress Control Number 54-012170.